Alaska Air Group is warning that it faces a challenging 2Q2013 as the maturing of new transcontinental routes and competitive capacity pressures in its markets to the state of Alaska are creating pressure on yields even as demand remains strong. Some of the steps Alaska has taken to rationalise its capacity between the US mainland and Hawaii as a means to improve its performance in those markets is being diluted by several carriers making a push into the state of Alaska during the summer high season in the northern hemisphere. Even though the carrier is spooling up new markets and facing increased competition in some of its mature markets, Alaska for the moment is sticking to its higher than industry average capacity growth for 2013 of 7.5%. However, the carrier is not completely wedded to its current expected capacity growth, and is evaluating the possibility of adjusting its supply targets during autumn 2013. Alaska Air Group’s unit revenues fell 4.6% year-on-year in Apr-2013 as competitive pricing that factored in some of its markets during 1Q2013 spilled over into 2Q. The weakness was evident in the company’s 1Q2013 yields, which were essentially flat year-over-year. The pressure stemmed from roughly one-third of Alaska’s network in Mar-2013 being subject to a 3% to 4% reduction in structured fares, mainly in Hawaii where fares from California to the Hawaiian Islands were on average USD50 to USD60 lower year-on-year, according to Alaska management. On other routes within and from California along the Pacific west coast Alaska saw industry fares fall between USD10 and USD20 within a seven to 13 day booking window, which is typically a period that generates higher yields. During the last year Alaska has seen increased competition from Virgin America in some of its California markets including service from Los Angeles to San Jose and service from Alaska’s Portland hub to Los Angeles and San Francisco. When Virgin America introduced service from United’s Newark hub to Los Angeles and San Francisco during Apr-2013 United stated that its rival's entry into those markets lowered fares by 20%, so it is likely part of Alaska’s yield pressure is due in part to fare undercutting by Virgin America. Competitive capacity increases from the US to Hawaii have been dragging down the performance of carriers serving those markets since mid-to-late 2012 as Hawaiian airlines remarked that competitive capacity between Hawaii and the US mainland increased roughly 13% during both 3Q2012 and 4Q2012, followed by an 11% rise in 1Q2013, which led to a 6% unit revenue decline for Hawaiian in those markets. Hawaiian management recently noted that some of the capacity additions are starting to unravel as Alaska, Allegiant and United have all announced schedule reductions. In early May-2013 Alaska removed the equivalent of two aircraft from its Hawaiian operations, which is resulting in frequency cuts to Kona and Lihue. But the positive effects of those reductions are being dulled by competitive capacity additions from the US Pacific northwest to Alaska during the country’s summer high season. 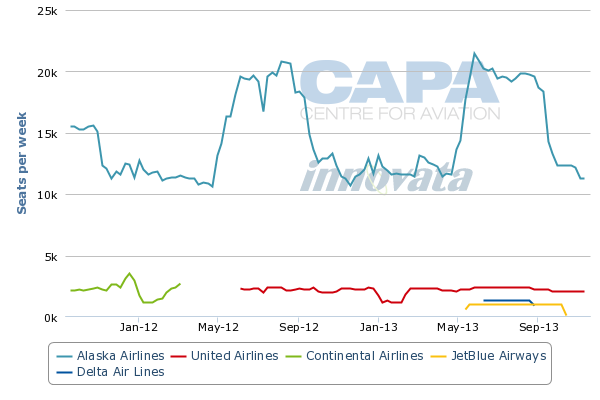 Alaska is facing a surge on some of its more traditional routes from the US mainland during the northern hemisphere high season, particularly in the Seattle-Anchorage market where seating capacity from the beginning of Jun-2012 to the start of Jun-2013 will rise approximately 15% year-over-year, according to schedules from Innovata. New service is being introduced by JetBlue and Delta between Seattle and Anchorage for the summer high season. JetBlue is building on seasonal service it introduced from Long Beach, California to Anchorage during summer 2011. The carrier could be marketing the service to some of its east coast passengers at it connects Seattle with its JFK base and its major focus city of Boston. US east coast passengers may find one-stop through Seattle more convenient than connecting through a hub located in the middle part of the country. Delta already serves Anchorage from its Minneapolis and Salt Lake City hubs, and given its focus on Seattle during the last year, introducing service to Anchorage seems somewhat logical even though its partner Alaska will have a commanding seat share of nearly 81% once the additional service is introduced by mid-Jun-2013. Alaska is likely already feeding some passengers from Alaska to Delta’s long-haul flights from Seattle, so perhaps Delta felt it could bolster its flow-through passengers during the busier summer season. Delta also is likely leveraging Seattle as a connection point for travellers to vacation in Alaska flying in from its other hubs including Atlanta, Minneapolis-St Paul, Salt Lake City, Cincinnati and JFK. Virgin America is also launching seasonal service from its main San Francisco hub to Anchorage for the summer season, upping direct competition with United. While Alaska does not directly serve San Francisco-Anchorage, fare undercutting by Virgin America could funnel some passengers on Alaska’s San Francisco-Seattle flights that would connect onward to Anchorage. Frontier Airlines is also relaunching its seasonal Denver-Anchorage service during summer 2013 in direct competition with Alaska and United and also re-launching service between Denver and Fairbanks, also in competition with United, who is launching once-weekly seasonal service from its Newark hub to Anchorage and resuming its seasonal Chicago O’Hare-Anchorage service, a route also operated by Alaska. 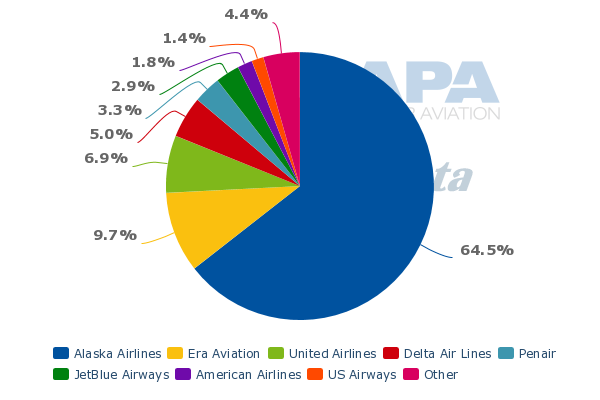 The added capacity in Alaska’s direct Seattle-Anchorage market will only result in United holding a 10% seat share, with JetBlue and Delta accounting for a 4% and 5% share, respectively, from mid-June-2013. All that service will do little to diminish Alaska’s commanding lead at Anchorage with respect to seat share, where it presently has an approximate 64% share, and will serve as the leading carrier on five of Anchorage’s top 10 domestic routes during the summer high season – Seattle, Fairbanks, Kodiak, Juneau, and Bethel. But as Alaska executives remarked at the end of 1Q2013, no weakness in demand was arising for the carrier during the next few months, “we have more of a yield challenge”, the carrier concluded, which is only being compounded by the added capacity in some of its more traditional markets, which will put some downward pressure on fares. Alaska, during the last year while determining how to adjust its capacity in the US-Hawaii market, has also made a US transcontinental and mid-America push, inaugurating flights from its Seattle hub to Kansas City, San Antonio and Salt Lake City. It also made a push from San Diego to Orlando and Boston and introduced service from its Portland hub to Washington National airport after gaining slots at DCA. It seemed like a sound strategy as it remains largely uncontested in those markets with the exception of US Airways’ service from Seattle to its Philadelphia hub and Southwest’s flights from Seattle to Kansas City. Alaska management at the end of 1Q2013 remarked those new transcontinental and mid-continental routes were still in the developmental phase, and not yet producing system average revenues. The airline likely needed to get through a period of offering promotional fares in those markets in order to build up awareness for point of sale at Kansas City, San Antonio and Salt Lake City, which played a role in the meagre 0.3% unit revenue growth Alaska Air Group recorded during 1Q2013. Company vice president of planning and revenue management Andrew Harrison remarked that some of the new longer-haul markets have just been launched within the last six months. He remains bullish about their long-term potential, noting they’re starting to mature and beginning to build as the busy summer season approaches. Yet even as they are gaining strength each month, the new market yields are still below the rest of Alaska’s network. Despite attempting to bring its transcontinental markets to maturity against a weak yield environment, Alaska is pressing forward with new transcontinental service from its Portland hub to Atlanta and Dallas/Fort Worth set to debut in Aug-2013. The carrier is offering a single daily flight in each market while at the same time trimming one of its twice daily frequencies between Atlanta and Seattle. The new service appears to be designed to coordinate schedules with American and Delta, who are both codeshare partners to Alaska and the dominant carriers in the respective Dallas/Fort Worth and Atlanta hubs. By offering its Portland customers connecting opportunities, the run-up to maturity in those markets could prove to be shorter for Alaska, perhaps delivering targeted yields in a shorter time frame versus non-codeshare markets. Any strategy to accelerate new market maturity is likely under close scrutiny given Alaska’s flat yield growth during 1Q2013. Alaska’s acknowledgement of its current revenue challenges is occurring against a backdrop of unit costs containment and the benefit of a balance sheet that displays less leverage than most of its US carrier counterparts. As its revenues and yields remained essentially flat year-over-year during 1Q2013, Alaska’s consolidated unit costs excluding fuel for the quarter fell 2.3%, and the company has revised unit costs guidance downward for 2Q2013 from flat to down a half-percent. But there are some clouds of uncertainty highlighted by the carrier including uncertainty surrounding its full-year unit costs including its airport expense in Seattle with respect to lease negotiations and new contracts with several labour groups. The company has been fortunate to keep its costs contained during the current weak yield environment in many of its markets, but admits it still has work to do to get its costs in line with its similar hybridlised competitors Hawaiian, JetBlue, Virgin America and to a degree Southwest. 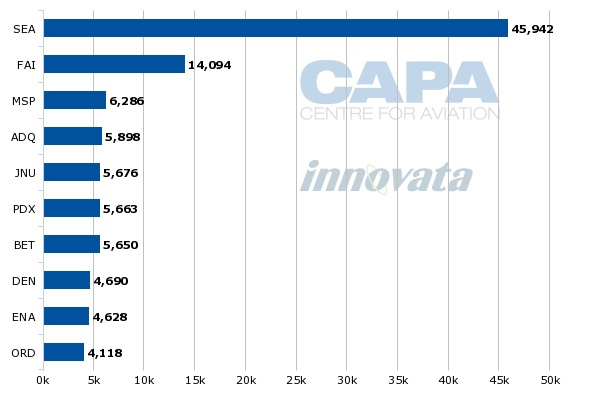 Among those carriers Alaska had the highest unit costs for the 12 months ending 31-Mar-2013. As it enlarges competition with those carriers, it will need to find ways to bring its costs in line with its hybrid competitors. One initiative set to begin later this year is to add six seats to its Boeing 737-800s and nine to its -900 variant as a means to drive down unit costs. Alaska expects to complete the project in late 2014. Alaska also has a favourable debt-to-capital ratio (adjusted for leases) of 53%, which is estimated to drop by 3ppt by the end of 3Q2013. It also had USD1.2 billion of cash as of 31-Mar-2013, and USD800 million in debt, which resulted in a debt-to-capital ratio (adjusted for leases) of 53% at 31-Mar-2013. Alaska expects the ratios to drop 3ppt by the end of 3Q2013. A sagging yield environment is plaguing Alaska at a time when it is attempting to rationalise its network to Hawaii and works to mature long-haul markets that could drag down its results for the foreseeable future. Despite those challenges Alaska has the foundation of a relatively strong and de-levered balance sheet that should help it withstand weakened competitive pricing in its network. Although it is sticking to capacity expansion targets in the high single-digits for 2013, it still only accounts for a small 3% to 4% of the US domestic market. Given its balance sheet strength, Alaska should be able to retain bragging rights of attaining profitability during particularly tough times – it has been profitable nine of the last 11 years.